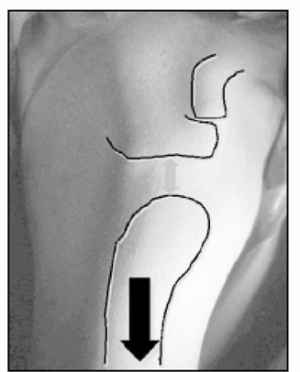 The Sulcus Test is used to assess the glenohumeral joint for inferior instability, due to laxity of the superior glenohumeral ligament and coracohumeral ligament. The test is considered positive when a sulcus sign is seen when the examiner applies a downward force applied at the elbow while the arm in neutral rotation and resting at the patient's side. A sulcus is defined as a depression greater than a fingerbreadth between the lateral acromion and the head of the humerus. ↑ Tzannes, A., Murrell, G. (2002). Clinical examination of the unstable shoulder. Journal of Sports Medicine. 32(7):447-57.